The IFN Family Day was a great event this year. The atmosphere and the sense of participation and unity was just wonderful. Appreciate the effort of Br. Yousuf and Sr. MaryAnn for bringing joy to the community as a whole. Just to highlight couple of events that I was involved in. We had a volleyball tournament of 4 teams. A pic of the winning team with the President is attached. Also, few of our daughters had a bake sale for the Syria Refugees to raise funds toward The Rice Drive, MashaAllah they raised $412 from the sale of Cookies, Cupcakes and Baqlawa! Many thanks to the EC leadership for recognizing the Members of IFN on this Family Day! it was truly a marvelous event. 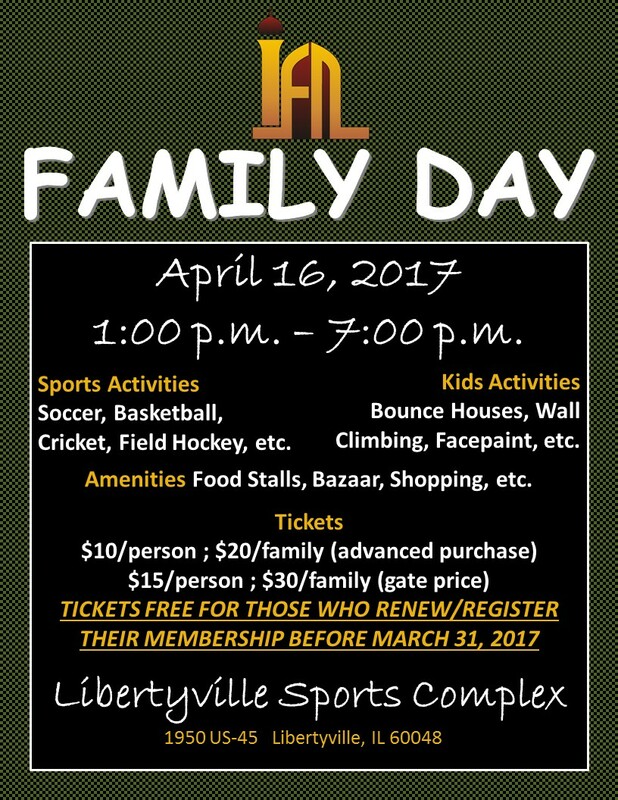 IFN FAMILY DAY IS SCHEDULED FOR APRIL 16, 2017 at Libertyville Sports Complex. Click Below to Register. See below to reserve a booth, sign up for sports and see further details. Inshallah we will have a fun filled day of activities with our IFN Families and Friends, We encourage you to invite your Extended Families and Friends as well from Chicago-land areas to join us for the event. •$10 per person and $20 per Family if purchasing in advance. •Otherwise it will be $15 per person and $30 per Family at the gate. •We encourage you to buy in advance so we can plan accordingly. InshaAllah we will start selling the tickets in the IFN lobby from this coming Friday. Meet N Greet, Rock Climbing for Young at Heart, Moonwalk, Sport Events (Cricket, Soccer, Hockey, Basketball, and Volleyball), Food Stalls, and Bazaar (Clothing, Jewelry, Perfumes, Artworks and other traditional items). Tennis Ball Cricket, Basketball, Soccer, Hockey and Volleyball Matches in the Libertyville Sports Complex’s 2 Indoor Arenas and Various Basketball and Volleyball Courts. We are looking forward to your participation to make this event an enjoyable a successful one InshaAllah! The Winter season in the Midwest can be long and keep you inside in hibernation longer than you had planned. In an effort to keep ties and provide an outlet for kids and families, IFN rents out the Libertyville Sports Complex for the day for the IFN community. Admission is nominal and it provides activities for younger kids such as inflatable bounce houses/slides, face-painting, wall climbing, and balloon animals. For the teenagers, both brothers and sisters, basketball and volleyball courts are available. The fun doesn't stop there with the soccer fields also available to play football, soccer, and cricket. Concessions are available and vendors also partake for those interested in a little bit of shopping and conversing over lunch, snacks, dessert, and drinks throughout the day. Keep an eye out for the event around early spring or late winter for details.